On 15 Feb 2018 Boeing issued Revision Nmber 5 of the 737 MAX FCOM. This page is a non-exhaustive list of the changes from V4. Inclusion of MAX-7 differences. E.g. Principal Dimensions, Turning Radius, Flap limit speeds, VREF+15 (not +20) etc. 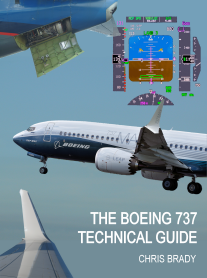 Much updated wording for 737 cross-model standardization. Standardized the use of disengage when referring to the autopilot and autothrottle. L.10.1 - Changed the section name from “Operating Limitations” to “Limitations and Operational Information” to clarify that operational information, not included in the AFM Limitations, is also contained in this section. I.e. each section now consists of AFM limitations and non-AFM operational information. SP.3.1 - Added note "The presence of the painted cold soaked fuel frost area on the upper wing and the inclusion of these procedures in the FCOM do not constitute operational approval. Operators may be allowed to use these procedures by referring to the appropriate regulatory authority for approval or exemption, as required, to implement the procedure. The requirement for one pilot to monitor the approach on the map is only needed for airplanes without Navigation Performance Scales. SP.6.2 - Added note to explain that the WHEEL WELL light can illuminate during the OVHT/FIRE test when on DC electrical power only. However, for accurate testing of the wheel well fire detection system, the test must be done after AC electrical power has been established. SP.6.4 - Changed to 3 minutes to allow for the APU door to fully close. The 3 minutes includes 1 minute for APU cool down and 2 minutes for APU door closure. This change is a result of 737 MAX operational experience. PI.32/42.12-19 - Non-Normal Landing Distance for LOSS OF BOTH ENGINE DRIVEN GENERATORS (all flaps) have been updated to remove available landing distances for autobrake settings. Autobrakes are inoperative under this non normal condition. Landing distances are also updated to account for anti-skid capabilities also being inoperative for this condition. For ANTI-SKID INOPERATIVE non normal condition flaps 15 and 30, the no reverse thrust correction was replaced with a new note to show no landing distance was calculatable for this correction condition. 7.20.3 - Added AMX-7 information for EEC Normal Mode limits. 7.20.9 - Updated graphic, deleted IDG fuel-cooled oil cooler and added air-cooled oil cooler. Changed HMU to FMU. Changed Main engine oil cooler to Main fuel/oil heat exchanger. 9.20.19 - Updated Flap Load Relief retract and re-extend airspeeds. 10.40.22 - Added WRT-2100 WXR radar system with version 2 Hazard display. 10.42.14 - Added HUD Perspective Runway (PRW) configuration option. 11.10.22 - Added Dual RDR-4000 radar system. 14.10.7 - Changed bullet from "temperature of one or more brakes exceeds 4.9" to "temperature of one or more brakes exceed 4.9 (standard BTMS) or exceeds overheat temperature threshold (adaptive BTMS)." This change is made to accomodate a brake temperature program pin configuration enabling an adaptive brake temp algorithm. Algorithm uses both brake temperature and rim temperature as sensed by the tire pressure sensors. 14.10.8 - Removed numerical values from the brake temperature indicator. Adaptive Brake Temperature Monitoring System values at which the temperature indicator turns from white (normal) to amber (overheat) varies depending on the algorithm. Adaptive option uses both brake temperature and rim temperature. Standard uses just brake temperature.